Today stayed dry, which meant Andy Pettitte finally got to take the mound for the first time since hurting himself in June. Everything went more or less according to plan in New York's 4-2 win over Toronto in the first half of their doubleheader. Pettitte neared his preordained pitch count of 75 by the end of the fourth inning, but came back for the fifth and breezed right through it to hit 75 on the nose before taking a seat for good. 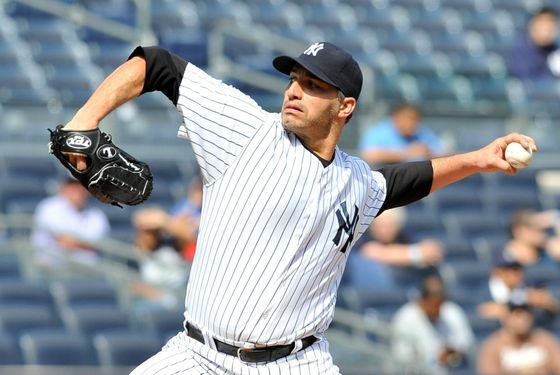 All told, he missed a few times and failed to cover first once or twice, but it was a fine outing which saw Pettitte ably dig himself out of several tight spots. The Yankee lineup did their part mostly early on, with Robinson Cano's meaty double anchoring a three-run first inning. That almost wasn't enough. David Robertson — who has fallen off something fierce — got beat up in the eighth, and Rafael Soriano had to work out of some trouble. Soriano found a way, though (Ichiro Suzuki catching a bobbled ball with what appeared to be his bellybutton helped), and the Yankees held on to take a momentary half-game lead over the Orioles. That lead could change up to a full game in either direction by night's end. David Phelps is on the mound for the second game of the doubleheader tonight at 7 p.m., then the second-place Orioles follow up last night's marathon in Seattle at 10 p.m. We've only begun!